On February 19, our Union met with the Franchise Tax Board (FTB) and the California Department of Human Resources (CalHR) to discuss the implementation of an additional fingerprint and background check process that will impact about 3000 of our members who work at FTB. Our fight for economic justice continues as we set the stage for contract negotiations. On February 27, our GeoPay Task Force presented the acting director of CalHR and a team of state representatives with an in-depth report recommending solutions to the economic challenges many state workers face caused by the high cost of living in the communities they live and work in throughout the state of California. What does the report illustrate? 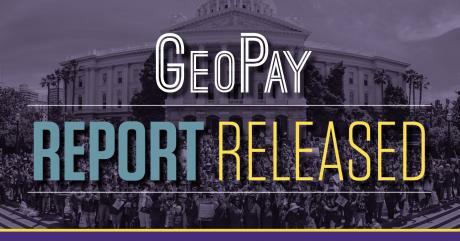 Click here to read the GeoPay Task Force Report. On January 22, 2019, our Union met with the State Compensation Insurance Fund (State Fund) to discuss the introduction of a monthly Quality Assurance (QA) form and process for Medical Provider (MP) phone agents located within the Claims Processing Center. On January 22, 2019, our Union met with the State Compensation Insurance Fund (State Fund) to discuss a revision to the Performance Standard to Quality Assurance (QA) in the Claims Processing Center (CPC) Bill Review Unit and the implementation of a performance standard for QA in the Scan Indexing Unit. When management fails to respect our contract, to recognize the work we do and the fair compensation we deserve, we protect our members with professional representation and deliver results. On August 29, 2018, Local 1000 and DMV continued negotiations regarding the department’s intent to open field offices on the Saturday before Veterans Day (November 10) and the Saturday after Thanksgiving (November 24). After long discussions around our negotiation team’s proposals, DMV has rescinded the requirement that the field offices be open on either day. This victory allows our DMV members to enjoy their upcoming holiday weekends. 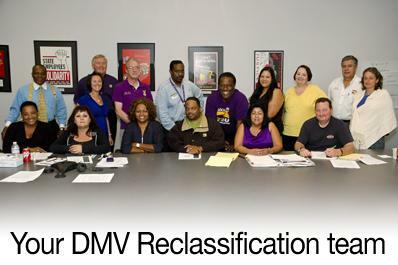 SEIU Local 1000 met and conferred with the Department of Motor Vehicles (DMV) on August 29, 2018 to continue negotiations regarding the impacts of the implementation of the RealID program. The primary focus of the discussions was around the increased hours and locations of operations at DMV field offices. On August 7th, 2018, our union met with the California Department of Human Resources (CalHR) and California Department of Corrections and Rehabilitation Department of Juvenile Justice (CDCR DJJ) to discuss the implementation of the Cellsense Contraband Detector program within the DJJ Facilities in the state. Local 1000 members are using the power of our union contract to address a wide variety of economic factors that deeply affect those we represent. With the support and help from members across the state, the team is already working to build the power and leverage we will need to be successful when we bargain our next contract. Due to new IRS rules regarding fingerprinting and background checks, the Employment Development Department (EDD) implemented new policies impacting about 5500+ of our members. Local 1000 met multiple times with EDD and the California Department of Human Resources (CalHR) to ensure the implementation was not overly broad and did not impact any of our members unnecessarily. We're building member power to leverage a great contract. 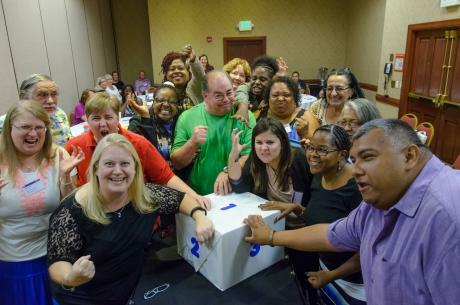 More than 150 newly-elected and returning bargaining representatives, members of the Statewide Bargaining Advisory Committee (SBAC), came together on July 14-15, taking important steps on the road to contract negotiations that will begin next year. Also elected was the 58-member Bargaining Unit Negotiating Committee (BUNC)—representatives from each of the nine bargaining units in Local 1000—the bargaining team responsible for negotiating our new contract. On May 30, 2018, SEIU Local 1000 met with the California Department of Human Resources (CalHR) to discuss the proposed consolidation of the Research Analyst, Research Program Specialist, Operations Research Specialist and Tax Research Specialist Series. This proposed consolidation will reduce the current 37 duplicative parenthetical classifications down to 7 generalized classifications. The consolidation is part of the Governor’s Civil Service Improvement (CSI) Project to reduce the number of existing classifications. On June 6, 2018, the Department of Motor Vehicles (DMV) Heat Team met with management to continue to negotiate the impact of the implementation of Real ID. Discussions were productive and positive as the team brought up a variety of concerns about workload, staffing levels, improving the Real ID process and providing Californians a better experience at the DMV field offices. Due to new IRS rules regarding fingerprinting and background checks, the Department of Child Support Services (DCSS) implemented new policies impacting about 400+ of our members. SEIU Local 1000 met multiple times with DCSS and the California Department of Human Resources (CalHR) to ensure the department’s implementation was not overly broad and they did not impact any of our members unnecessarily. Bargaining unit representatives Susan Rodriguez (Unit 1, Alternate Vice Chair) and Sophia Perkins (Unit 4, Chair) met with State Fund and CalHR to negotiate impacts to existing performance standards and the creation of new performance standards for Workers Compensation Claims Adjusters (WCCA), Workers Compensation Insurance Technician (WCIT) and Program Technicians (PT) being implemented by State Fund. The BOE and CDTFA Joint Committee met on November 29, 2017, with representatives from the Government Operations Agency (GovOps), the California Department of Human Resources (CalHR) and the Department of Tax and Fee Administration (CDTFA). The BOE and CDTFA Joint Committee met on November 9, 2017 with representatives from the Government Operations Agency (GovOps), the California Department for Human Resources (CalHR) and the Department of Tax and Fee Administration (CDTFA). The employees who work in the Alcohol division will have their functions and work embedded in CDTFA, and the state made it clear that the resources and authorities for these employees to do their work would be in place. Just weeks after sending our notice of opposition of CalHR’s Reclass plan, CalHR was compelled to return to the bargaining table. 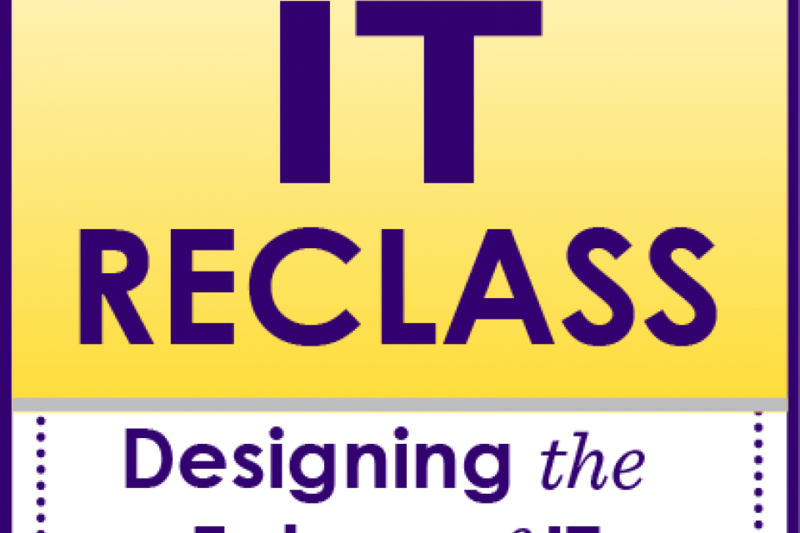 On Nov. 1, our IT Reclass Team met with the state and fought to win pathways for the Information Systems Technician and Computer Operator classifications to move into the new IT classification series. The CDTFA Joint Committee met on October 11, 2017, to continue discussions regarding the restructure of the Board of Equalization and the formation of the California Department of Tax and Fee Administration. The majority of the meeting was dedicated to addressing the issues that are impacting our members who work at BOE. After weeks of worksite meetings at BOE and CDTFA and a phone banking campaign to contact BOE employees, the team identified and brought to the table those issues that have been affecting our BOE members. On September 27, 2017, the SEIU Local 1000 committee met with representatives from the California Department of Human Resources (CalHR), the Government Operations Agency (GovOps) and the California Department of Tax and Fee Administration (CDTFA) to discuss the issues raised by our members regarding the restructure of the department. Tamekia Robinson, our Vice President of Organizing/Representation met with Sen. Cathleen Galgiani and department representatives at the CDTFA/BOE headquarters building for an update on the repairs and upgrades underway at 450 N Street in Sacramento. The tour included a meeting with Nick Maduros, the new department director, who is working with our CDTFA Joint Committee to preserve our members’ rights during the current BOE reorganization. 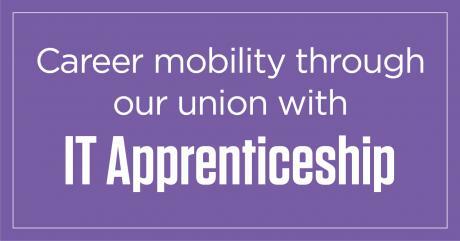 Professional development and upward mobility are key priorities for our union, and our members, and an innovative new Information Technology (IT) Apprenticeship Program offers Sacramento-area members an opportunity to improve their state careers. 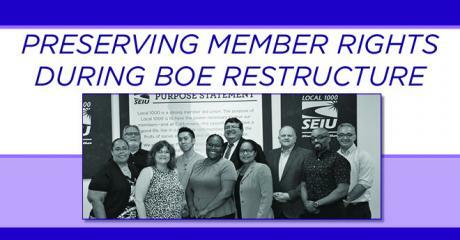 Our union leaders have established a Joint Committee with the state to preserve and protect members’ rights during the upcoming restructuring at the Board of Equalization (BOE). After the passage of the Taxpayer Transparency and Fairness Act of 2017, the state reorganized BOE into separate entities: California Department of Tax and Fee Administration (CDTFA), and BOE. In 2018 the Office of Tax Appeals (OTA) will be established. 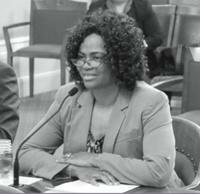 On August 16, 2017, SEIU Local 1000 met with representatives from the California Department of Human Resources (CalHR), Government Operations Agency (GovOps) and the California Department of Tax and Fee Administration (CDTFA) to continue to mitigate the impact of the restructure. Our union met with representatives from the California Department of Human Resources (CalHR), the California Department of Tax and Fee Administration (CDTFA) and the Government Operations Agency (GovOps) to kick off the Joint Labor Management Committee that will address the recent restructure of the Board of Equalization (BOE). 2016 was a historic year for our members, our union and all Californians. We came together to fight for a contract we can all be proud of and nearly went on strike for the first time in 44 years. As a result, we won the largest labor contract ever negotiated with the state, and we did it by standing together in our union. You can view our contract here. Starting August 1, we’re receiving our first paycheck reflecting our 4% general salary increase—one of the many outcomes that we won in contract negotiations. Nearly 600 Local 1000 members working at CalPERS now have the opportunity for more career mobility after our union negotiated to protect and preserve the rights of Retirement Program Specialists (RPS) who are offered the chance to move laterally into new classifications. $500 is accrued for all employees that meet the criteria each full quarter effective July 1, 2017 until separation from DDS. As you may know, one of our big gains we made through bargaining involves geographic task force, which will look at how workers who do the same job and work in high cost-of-living regions are compensated. The State and our Union will participate in a task force to evaluate how the cost of living in certain areas creates recruiting and retention problems for certain state jobs. We are looking for members to participate in the Geographic Compensation Work Group who are deeply connected and have direct experience dealing with this issue. Are you interested? On March 1, 2017, the Employment Development Department, Unemployment Insurance Division will offer the 68 most senior Permanent Intermittent (PI) employees conversion to full time status. If an employee rejects the opportunity to convert, the department will move to the next most senior PI. This conversion will be immediate unless the impacted employee elects to delay the date to July 1, 2017, because they are enrolled in the Flex Cash Option for health and/or dental benefits, and they do not want to forfeit that benefit. Governor Jerry Brown today signed Senate Bill 28 (Pan), the bill authorizing the Memorandum of Understanding between the state and SEIU Local 1000, our union representing 96,000 employees, about 40% of the state’s workforce. In a big step forward, our Tentative Agreement (Senate Bill 28) cleared the Senate on Feb. 17 with a 26-7 vote. Our TA cleared two previous hurdles earlier in February by being approved by two Senate committees. The bill now moves to the Assembly. SB 28 will first be heard in the Assembly Budget committee on March 2 upon adjournment of the Assembly floor hearing that day. The bill will be voted on by the Assembly floor at a future date, then on to the governor’s desk for his signature. Our Tentative Agreement cleared two hurdles this week as it makes its way through the Legislature and closer to the Governor’s desk. 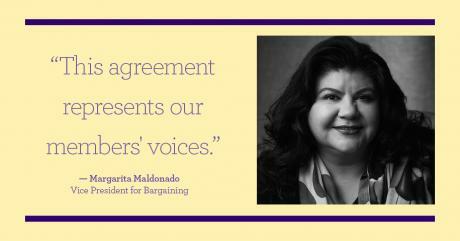 Vice President for Bargaining Margarita Maldonado testified before two Senate committees in support of our agreement, and both committees voted to move the TA forward. Speaking on Feb. 6, Maldonado told the Senate Public Employees and Retirement Committee that we represent about 40% of California’s total state employees and provide a broad range of valuable services to California and our communities. After nearly eight months of negotiations, we have reached a tentative agreement with the state, early Saturday morning, on a contract we can all be proud of. Below is a basic overview of what we won on compensation. This overview does not include any information on the non-economic improvements that were agreed upon, or how we plan on addressing some of the concerns we raised about the state’s conduct during bargaining. As we work to finalize and compile all of the tentative agreement we will send you additional details. We have been in negotiations with the state for six months and have reached agreement on many items. Our intention is to continue to negotiate in good faith on all remaining terms. However, we have not yet reached agreement on a livable wage that values our work and respects the services we provide to all Californians. Local 1000 members provide valuable services to the state of California and our communities. We believe everyone who works hard for a living should be able to provide for their families. But we’re dealing with a tale of two cities here. Our bargaining team met with the state for the first time in three months and ended the week frustrated by a continued lack of movement by the state on key issues. Earlier in the week, our team presented eye-opening information illustrating the gender pay gap in state civil service. Our union is 66% women and 34% men. The seven unions the state has reached agreement with, overwhelmingly comprised of men, are paid a staggering 43% more than Local 1000 members. Our bargaining team worked hard today with the state’s negotiators to achieve a common understanding of the state’s Civil Service Improvement (CSI) initiative – a broad-based strategy to reform civil service employment, including recruitment, training, and a much-needed revamp of outdated classification specifications. Our team is working to solve some deep frustration with the state’s slow progress and the lack of involvement with our union to create a real plan with real timelines. Our bargaining team met with state negotiators today for a detailed discussion about the cost of retiree health care – one of the key issues remaining to be settled as we work for a contract we can all be proud of. “We’re challenging the assumptions the state is using to calculate the costs of this benefit and the share our members will be asked to pay,” said Yvonne R. Walker, Local 1000 President. Boosted by the actions in our workplaces over the last few weeks, our bargaining team returned to the table today with state negotiators and called for a pay raise that respects the valuable services we provide to all Californians. We reminded the state that in the months since we last bargained, we heard from thousands of members who said at town halls and in surveys that the state’s offer doesn’t recognize our hard work; that working families shouldn’t have to live paycheck to paycheck. I’m writing to you with a very important message about contract negotiations. 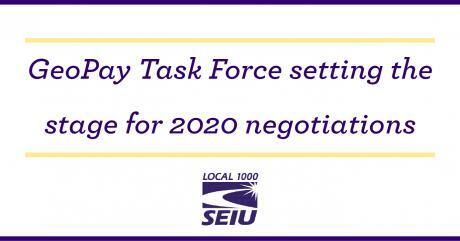 During our July 30 executive session, our SEIU Local 1000 Board of Directors voted unanimously to authorize a statewide membership vote on any and all concerted actions, up to and including a strike, in support of bargaining our contract. In short, we are exploring every option available to win a contract we can all be proud of. After three months of bargaining in good faith, our negotiations with the state have reached a crossroads. In an era of healthy state finances, our bargaining team feels that the state’s offer does not meet the priorities that you shared with us through town halls and bargaining surveys. Beginning Friday July 8, we’ll be holding a series of town halls up and down the state where members will hear the details of the state’s offer and have an opportunity to share their thoughts and opinions. Progress Won by Worker Actions! Your actions are working and making the difference at the bargaining table! After CalHR Director Richard Gillihan insulted us and said we were only worth a 10% increase over four years and a 3.5% contribution to retiree healthcare, you stepped up the pressure and took immediate action. We responded the next day by holding worksite actions up and down the state and flooding Gillihan’s phone with the message that we are worth MORE than 10% and we will not stop until we get a great contract. It worked. Our collective action pushed the state. In a productive day of negotiations, our Local 1000 bargaining team made significant advances Saturday, moving more of our members’ priorities into the contract and fine-tuning proposals to maximize our rights and protections. Our Local 1000 bargaining team returned to the master table today for the first time after thousands of members gathered Wednesday at the state capitol to rally for a great contract. We met with the state briefly to review and understand the scores of proposals previously presented by Local 1000, and still requiring a response from state negotiators. One day after thousands of Local 1000 members gathered at the Capitol to rally for a great contract, our Unit 1 bargaining team met with state negotiators today to press for resolution on a number of still-outstanding contract issues, including career mobility proposals. Still frustrated after the state took unprecedented action by rejecting a series of Unit 1 compensation proposals at the master table on Tuesday, the Unit 1 team pressed for more explanation about the state’s reasoning. There was no satisfactory answer, and no alternative solutions proposed. Thousands of members hold huge rally for a great contract! In complete disregard for the important work that we do and the vital services we provide to California, the state today flat-out rejected our salary proposals. The Unit 1 bargaining team returned to the table today and, after a full day of negotiations, walked away frustrated by the state’s lack of action. State negotiators have yet to respond to many key proposals we presented to them on behalf of Unit 1 members over the last six weeks of bargaining. Many of those proposals have been in the state’s hands for at least 30 days, and some were presented as far back as April 19. Last night, Local 1000s leaders signed an agreement that allows us to avoid arbitration and means the state will have to pay $1.5 million to employees of the California State Lottery who were wrongly denied overtime pay. Local 1000 leaders met with the state on Monday to finalize a settlement that has been two years in the making. The agreement we signed allows us to avoid arbitration and means the state will have to pay $1.5 million to employees of the California State Lottery who were wrongly denied overtime pay. The Unit 1 bargaining team went to the table with the state today and presented proposals to make the compensation our members receive more reflective of the valuable work they do, and to create a partnership designed to update and improve the civil service system. 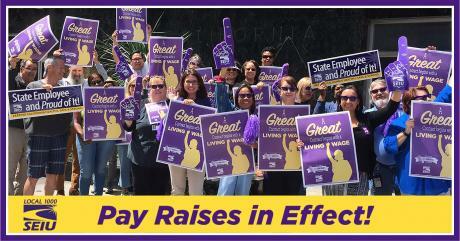 Our members wrote in and sent pictures to tell the state what a pay raise would mean to them and their families. Over the past four weeks of negotiations, our bargaining team has presented our proposals on the themes of working conditions, health and safety, leaves and upward mobility. All of this has built to this week’s theme: compensation. Unit 1 went to the table today and began putting salary adjustments on the table. Our Unit 1 bargaining team went to the table May 4 to continue to press the state for improved career development opportunities for our members. The team shared more information to reinforce the importance of earlier proposals they presented that would increase opportunities for training and career development. Local 1000’s Unit 1 bargaining team met with state negotiators today, representing the interests of our members who are Professional Administrative, Financial and Staff Services employees. Today’s bargaining session focused on professional development for Unit 1 members. Career and upward mobility is a high priority of our members and is a theme throughout bargaining this week. Local 1000’s Unit 1 bargaining team met with state negotiators for the first time today, representing the interests of the Professional Administrative, Financial & Staff Services workers we represent. The team shared their diverse backgrounds and deep job experience with the state’s negotiators, describing the work they do to keep California moving forward, healthy and strong. In all, our Unit 1 team is comprised of members from more than 14 state agencies with 360 years of combined service to the state. Local 1000’s bargaining team met with the state today in our first day of contract negotiations – backed by thousands of our members who “purpled up” and participated in worksite actions up and down the state in support of a great contract. On March 25, 2016 committee members from ten (10) Local 1000 impacted classifications, members of the Unit 1 Bargaining Team and representatives from CalHR and multiple departments met to finalize their report on recommended solutions to the recruitment and retention problems those classifications currently face. These recommendations will be presented to Richard Gillihan, Director of CalHR, and ultimately to the State Administration. Over the last few months the Unit 1 Bargaining team members and members in over 34 classifications prepared expert testimony to present to the California Human Resources (CalHR) department. Listed below are the members who are doing excellent work in representing your classification group during this process. The last classification group presented their testimony and proposal to CalHR on February 4th. Union Members are talking. Are you Ready? As we prepare for 2016 Contract Negotiations, state employees all over California are getting ready to step into the arena and fight for a good contract. We will need an active and informed membership to do battle at the bargaining table, at the ballot box, and in the legislative budget battles to fund state services. This is no time to sit on the sidelines. It’s Our Union. Our Union. Our Future. On November 20 and 24 teams representing the District Sales Representatives (DSR), Personnel Specialists, Tax Auditors, Workers Compensations Claims Adjusters (WCCA) and Financial Institution Examiners (FIE) series met with the California Human Resources Department (CalHR) under Article 5.17.1 to discuss recruitment and retention problems the series is encountering. Each of these teams were comprised of member leaders from the classification series and BUNC representatives. Local 1000 met with CalPERS management on October 26 to discuss changes to the CalPERS Actuarial Study Program. This program provides support for employees in the Actuarial Office who are preparing to take their certification exams. Local 1000’s team included Stuart Bennett (Unit 1 DBUR and Senior Pension Actuary), Latreece Smith (President of DLC 781), Tony Cuny (CalPERS Actuarial Assistant) and Wandra Pitts (Vice President of DLC 781). In accordance with Article 13.7.4 of our contract, State Compensation Insurance Fund (State Fund) notified the Union of their intent to implement performance standards for some Program Technicians and Worker’s Compensation Insurance Technicians working in the Claims Processing Centers. Per the contract, State Fund requested a meet and confer over the issue. On August 24th and 25th a team representing Correctional Case Records Analysts (CCRAs) met in Sacramento to negotiate with the state regarding the Recruitment and Retention issues they were currently experiencing. Cathy Reabold, DSH, Coalinga State Hospital. On August 24th and 25th a team representing 3 classifications met in Sacramento to negotiate with the state regarding the Recruitment and Retention issues they were currently experiencing. Our 63-member Bargaining Unit Negotiating Council (BUNC) recently spent three days training intensively for upcoming contract negotiations. Local 1000’s contract expires July 1, 2016 – just ten months from now. Bargaining strategies and tactics were key topics, along with discussions about member engagement. The focus: honing the skills necessary to negotiate a fair contract that protects our hard-earned rights from previous contracts while improving our wages, working conditions and benefits. Nearly 200 bargaining representatives from across the state voted this weekend to elect Local 1000’s 63-member Bargaining Unit Negotiating Council (BUNC). These member activists and leaders will be responsible for negotiating the successor contract. The current contract expires July 1 of 2016. Representatives from each of the nine state bargaining units met Saturday afternoon and evening to elect their bargaining teams. When Job Steward Lonnie “Tony” Owens attended a Joint Labor Management Committee (JLMC) meeting last year, he came prepared to present management with the concerns of his CalPERS coworkers in the Information Technology Services Branch (ITSB). What he provided was perspective regarding the staff’s frustration with the department’s lack of communication concerning their critical skills and training. That vacuum of communication too often leads to work being outsourced that could have been done by existing state staff. Seventy Local 1000 members at the Employment Development Department (EDD) stepped up to soften the blow for some of their coworkers who faced reduced hours. As a result, what would have been a major reduction in work and pay for a few people was distributed among a larger group for a much less significant negative impact. Swift and decisive action by Local 1000’s legal department shut down a hostile manager’s suppression of our members’ right to conduct union activities at Department of Social Services (DSS). The union’s determination to not let bullying behavior stand forced DSS to agree to completely withdraw spurious charges against our members. Local 1000 has launched a comprehensive survey that will advance the effort to review job specifications that have not been updated in decades. We have made it a high priority to resolve the problems with IT classifications, training, compensation and outsourcing. The state has committed to working with the union by modernizing the IT classification system. Both parties recognize a mutual interest in adapting to the changes in a field with a highly competitive labor market. When the State Compensation Insurance Fund (SCIF) imposed a new set of performance standards without consulting the union, they violated our contract as well as state labor law and Local 1000 took them to task. Ensuring good working conditions for our members is a key element of Local 1000’s contract enforcement efforts, so when workers reported a pattern of harassment at the Modesto DMV over sick leave, the union stepped in to stop it. Three members at Centinela State Prison used Local 1000’s grievance system to win back pay and certification after working out of class for a year. Though all three are in the classification of Senior Account Clerk, they were working out of class as Accountant Trainees, apparently with the prison’s knowledge though our contract expressly requires prior CalHR approval. Thanks to a grievance filed by a Local 1000 member and aggressively pursued by the union, Correctional Training Facility (CTF) management agreed to stop using electronic monitoring for timesheets, a practice expressly forbidden by our contract. Persistent pressure from Local 1000 paid off for 125 Permanent Intermittent workers at the EDD’s Unemployment Insurance branch who will be converted to full-time status on May 1. Our members have been vigilant in demanding the department comply with our contract and recognize longtime EDD employees with the benefits and career advancement opportunities that come with full-time status. Recruitment and retention is moving forward in Bargaining Unit 1. Local 1000 has set a May 5 meeting with CalHR to discuss ground rules and the order in which to discuss information about the various classification and classification groupings. The Bargaining Unit Negotiation Committee members have been assigned to the classifications/groups and are working on organizing those groups and building support in the field for the groups to which they have been assigned. Thanks to the persistent efforts of organized members at the California Board of Equalization (BOE), employees no longer have to contend with an unnecessary and patronizing “motivational” program. Called “The Four Disciplines of Execution”, or 4DX for short, the program is the work of an outside consulting firm which used ineffective and sometimes insulting graphics and acronyms in a failed attempt to inspire workers to meet goals. By enforcing our 2013 contract, a determined group of stewards has forced their division of the Department of Social Services (DSS) to accept joint labor management committees (JLMC) statewide and at all of its regional offices. Local 1000 fought for JLMCs through a stewards’ grievance, affirmed by CalHR in a March 10 decision entitling 1200 DSS employees in the Disability Determination Service Division (DDSD) to actively participate in workplace change. In a huge win, Local 1000’s DMV “HEAT Team” signed up 1000 new members. 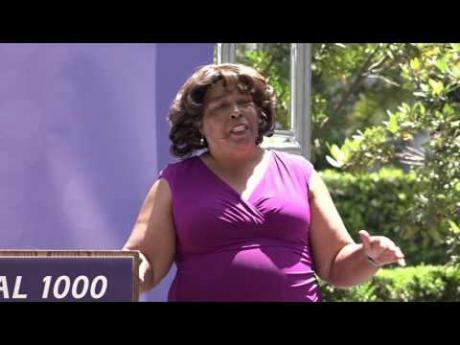 “Our DMV HEAT Team is doing some amazing work,” said Local 1000 President Yvonne R. Walker. Hannah Konnoff grew up with a mother who was active in the civil rights movement, a feminist and an anti-war protester. Although she had been raised to act on her values, life compelled Konnoff to put her activism on the back burner. “I just kind of got wrapped up in trying to survive,” she said. Building power in the community, facing challenges and developing union leaders were key themes of last week’s meeting of the Statewide Bargaining Advisory Council (SBAC) in Southern California. Nearly 200 elected bargaining representatives from up and down California—including the 60-plus members who negotiate our contract with the state—meet three times each year to develop strategies for bargaining and to understand and respond to issues that affect our lives at work and at home. Thanks to an agreement negotiated by Local 1000, nearly all represented workers at the State Compensation Insurance Fund (SCIF) will receive a 2.4 percent performance award this year. Announced on February 20, the annual award will go to everyone who is qualified to receive it. Effective January 1, 2015, the personal vehicle mileage reimbursement rate for state employees will increase to 57.5 cents per mile. This reflects an increase over the 2014 rate, which was 56 cents per mile. In 2006, Local 1000’s bargaining team successfully negotiated contract language that would more fairly reimburse members for their personal vehicle usage. As a result, the state’s mileage rates mirror those established by the Internal Revenue Service (IRS), which are modified annually to reflect variations in gasoline prices and vehicle maintenance costs. Local 1000 is aggressively pushing a grievance over the ratio of Permanent Intermittent (PI) employees at the Employment Development Department (EDD) to arbitration after the California Department of Human Resources (CalHR) recently rejected our claim. Our contract has long-standing language limiting the number of PI employees to no more than 20 percent of the number of staff positions in each of the EDD departments. The Bargaining Unit 1 Recruitment and Retention (R&R) Team has completed reviewing the applications and have selected the classifications that will be presented to the California Department of Human Resources (CalHR) for assessment. The R&R team would like to thank the 500 members that took the time to complete these applications and represent their classifications issues. California Correctional Health Care Services (CCHCS) has mailed more than 600 State Restriction of Appointment (SROA) letters to Local 1000 members in seven of our nine bargaining units in anticipation of just over 200 planned layoffs scheduled to occur on December 1, 2015. The majority of the layoffs affect bargaining units 17 and 20; the other affected bargaining units are 1, 3, 4, 11, and 15. The California Department of Corrections and Rehabilitation (CDCR) has implemented the Realignment Wave 5 layoff process. The layoff date will be effective September 30, 2014. CDCR sent over 800 SROA letters out to Local 1000 members across the state. Local 1000 representatives met with the State Controller’s office (SCO) and California Human Resources (CalHR) to discuss the continued resolution of the now-discontinued MyCalPays program. The State made it clear that although they were close to identifying and correcting the numerous over- and underpayments during the 8 months the system was active, but still had additional work to perform – with a goal of settling all of the accounts by December 2014. Local 1000 representatives are welcome in any meeting where an impacted employee requests one. The Unit 1 Recruitment and Retention (R&R) application process closed on April 30, 2014. There were slightly fewer than 500 submissions from members. Local 1000’s research department is compiling the information provided into the individual classifications, and will provide the results to the Unit 1 bargaining team. Local 1000 may present up to 10 different classifications to the state for a discussion of issues that impact the recruitment and retention of employees in that classification. The selection process is targeted for completion by June 30. In accordance with Section 5.17.1 of the recently agreed upon Memorandum of Understanding (MOU), your Statewide Bargaining Action Committee (SBAC) has finalized the application process for selection of the classifications presented by the Recruitment and Retention (R&R) Committee. “This application is the first step in finally resolving so many of the retention and recruitment problems that our Unit 1 classifications continue to experience,” explained Brenda Modkins the Chair Unit 1. Local 1000’s bargaining team signed the first tentative agreement of our new contract at the master table today, one that provides a huge advance in our fight against outsourcing. More than 40 Local 1000 members have received up to $8,000 in tuition reimbursement in the first year of a new educational program at the State Compensation Insurance Fund (SCIF). The program was developed at the bargaining table as Local 1000 negotiated the effects of layoffs and restructuring at SCIF in 2012. 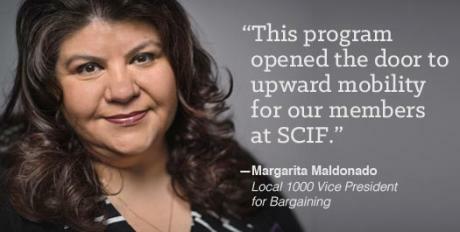 Local 1000 argued that SCIF wasn’t doing enough to prepare its work force to be leaner, more educated and highly skilled – goals that SCIF identified as a necessary part of its restructuring. Nearly all Local 1000-representedworkers at the State Compensation Insurance Fund (SCIF) will receive a 2 percent performance award later this year thanks to an agreement Local 1000 negotiated with management at the state-owned worker’s compensation insurer. Contract implementation and fighting for working families were the focus of a recent gathering of Local 1000’s Statewide Bargaining Advisory Council – held Feb. 8 and 9 in Manhattan Beach. More than two hundred elected Local 1000 members attended – our unit bargaining teams, along with other District Bargaining Unit Representatives (DBURs) and Classification Bargaining Unit Representatives (CBURs). 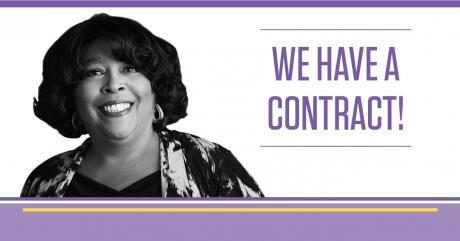 A Local 1000 activist for more than 15 years, Shelia Byars is stepping up once again and volunteering for campaigns that go beyond the worksite–working toward a better life for all Californians. After a seven-year campaign, aviation consultants win a much deserved pay raise. Aviation consultants, a small group of Unit 1 members in Caltrans whose job is crucial to public safety, will receive a 7.5 percent pay increase under terms negotiated by Local 1000; this pay raise is retroactive to July 2, 2013. A new Injury and Illness Prevention Program – developed with input from Local 1000 – will roll out over the next year at Napa State Hospital (NSH). Designed to improve the safety and well-being of NSH employees, the new program features education and training, risk assessments, safety inspections, comprehensive reporting and an emergency response and action plan. 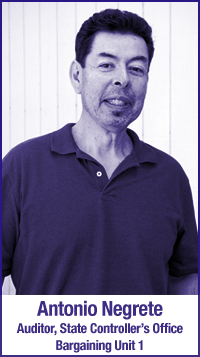 Ed Diprosper helps unemployed Californians for EDD. A Local 1000 member was honored for his work as a part of National Disability Employment Awareness Month – a national campaign that raises awareness and celebrates the many contributions of America’s disabled workforce. Ed Diprosper, a 15-year veteran of state service is a Unit 1 member who helps to connect unemployed Californians with their much-needed benefits through his work at EDD, was praised for his efforts as part of a presentation at the Capitol by Assemblymember Dr. Richard Pan. 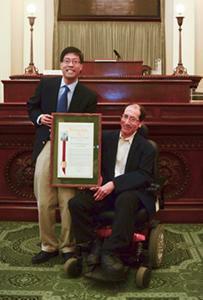 >> Click here for more information about Local 1000's State Workers with Disabilities Committee. Even before she began working for the state, MeShan Rachal was always an activist, but after seeing the power of her union in action, she stepped up for her fellow workers and the middle class in many ways. Rachal became a Local 1000 activist after a complicated bureaucratic snafu caused her to be underpaid for a week every month. She pressed her case to her supervisors and to the Department of Personnel Administration. When that failed, she sought contract enforcement help from her union. After receiving 3,397 letters from Local 1000 members, Gov. Jerry Brown signed into law a bill that adds legislative muscle to our ongoing fight to protect jobs and prevent wasteful government spending.AB 906, authored by Assemblymember Dr. Richard Pan (D-Sacramento), increases public scrutiny of private vendor contracts that are out of control and receiving little oversight. 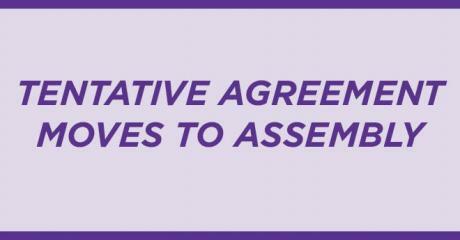 A wage increase, a guarantee of no new furloughs and a range of other improvements to our rights and working conditions lead the advances secured in our new 3-year Master Agreement. The agreement was reached between the Local 1000 bargaining team and representatives of the state, ratified by 90 percent of voting members and signed into law by the Governor. Language is also included pertaining to each individual unit. Our Unit 1 team – representing Professional Administrative, Financial and Staff Services – spent 18 hours negotiating with the state Friday and Sunday, and signed tentative agreements addressing several of the priorities of Unit 1 members. The Unit 1 bargaining team – representing Professional Administrative, Financial and Staff Services – presented a series of powerful witnesses to support our proposal to address equity adjustments for Unit 1 classifications. The presentation included eight witnesses representing different classifications or department. The Unit 1 bargaining team – representing Professional Administrative, Financial and Staff Services – was at the table today. Today, Local 1000 returned to the negotiating table to meet with representatives from the state and continue bargaining for our new contract. The state spent the last two weeks reviewing the proposals we gave them in April – 29 Master Table proposals affecting all Local-1000 represented employees, and 50 different proposals affecting our nine individual bargaining units. Local 1000’s bargaining team – more than 200 member-elected representatives – worked through the weekend to review the results of bargaining surveys and develop conceptual proposals that will drive our upcoming contract negotiations with the state, which are slated to begin April 10. On March 1, 2013, SEIU Local 1000 reached an agreement with the state on mitigating the impact of CCHCS layoffs set for March 31, 2013. These provisions may help you if you are slated for layoff, or have been transferred or demoted in lieu of layoff. Below, please find an explanation of the provisions of the agreement and tips on how to use it. The Local1000 Statewide Bargaining Advisory Committee–consisting of more than 200 elected members from throughout the state–came together Jan. 12-13 to map out a strategy and timeline to guide our upcoming fight for a fair contract. Their agenda included development of an aggressive plan to gather member input and to engage and mobilize thousands of state workers to support the bargaining process. Local 1000’s fight against wasteful outsourcing has tallied another win: CalPERS has agreed to hire 86 skilled workers, mostly information technology (IT) professionals in Bargaining Unit 1, to reduce the agency’s reliance on contractors. The positions should be filled early this year. CalPERS, the state’s massive public pension system, is back in hiring mode, big time. The fund’s board of administration moved Wednesday to create 86 new positions ASAP. If all of the new jobs are filled – and that’s not a given – the new hires would add $16.3 million to CalPERS’ $357.6 million administrative budget and bring its total headcount to just shy of 2,600 employees. In the time it took to read this, some of you have done the math: The new hires would cost nearly $190,000 each. So why might the state have trouble hiring? Effective January 1, 2013, the personal vehicle mileage reimbursement rate for all State employees will be 56.5 cents per mile. The relocation/moving mileage reimbursement rate for all current State employees and New-Hires to State service will now be 24 cents per mile. Darlene Estey first got active in Local 1000 because she was mad–at her union. Local 1000 members and staff successfully identified and challenged two instances where contracting out would be wasteful, and the State Compensation Insurance Fund (SCIF) has agreed to cancel two outsourcing contracts providing 93 jobs for Local 1000-represented employees. After receiving complaints about the contracts from rank-and-file members, Local 1000 pressured SCIF to insource the work. 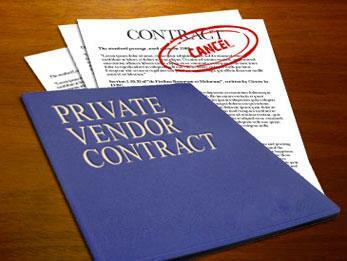 This included filing a challenge with the State Personnel Board questioning the legality of the contract. During negotiations last spring over proposed layoffs, Local 1000 argued that State Compensation Insurance Fund (SCIF) wasn’t doing enough to prepare its work force for the State Fund of the future – an organizational model which will be leaner, more educated and highly skilled. State Fund heard our concerns and has announced new educational programs for SCIF employees – major steps in the right direction. Local 1000’s success at the polls on Nov. 6 came down to one thing: Volunteers. At 10 a.m. on October 10, hundreds of Unit 1 and Unit 4 members in EDD unemployment branches statewide silently stopped working, stood up together and waved their pendants, banners and flags which read CAUTION: EDD Workloads out of control (see image to right). Local 1000 Joint Labor Management Committee (JLMC) members from the DDSD of the California Department of Social Services met on August 30, 2012 to review the results of the recent Case Receipt survey. Communication has become a challenge due to DDSD’s reconfiguration of email addresses. The JLMC is awaiting the state’s response for the next meeting - leaders are prepared with an agenda and the team has been identified. Local 1000 provides skilled, professional representation for the members of Bargaining Unit 1. Watch the video below as Local 1000 members speak about why it’s important for all state workers to have a union that has their back. Hundreds of bargaining unit member leaders recently met on October 6-7 in San Diego to discuss critical campaigns for Local 1000. Representatives came from all areas of California to discuss the importance of the November election and make over 3,400 calls to urge a NO vote on Proposition 32. We heard from speakers from our coalition partners such as the League of Women Voters and the Center on Policy Initiatives regarding the importance of partnering to defeat anti worker propositions and campaigns. On July 11, 2012, an updated and standardized “expectations memo” was distributed by DMV to statewide offices that included many of the suggestions brought forth by the Local 1000 DMV team. 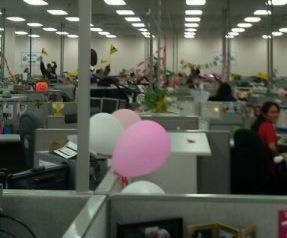 The DMV reclassification team is on schedule to finish their work in Spring 2013. Next steps of the reclassification effort were discussed during a meeting held with the Local 1000 reclassification team, DMV management and the California Department of Human Resources (CalHR) on August 17. Currently, CalHR is reviewing the Unit 1 and Unit 4 job classification changes as proposed by the Local 1000 DMV reclassification team and DMV. On Thursday, September 20, over 80 Sacramento members and staff found a festive way to conduct some serious business – educate voters on the dangers of Proposition 32. Unit 1 member organizer Dee Dee Munson and Unit 4 member organizer Lorraine Dewitt created a night of training, raffles, poster-making and all around good fun to get more members politically involved. 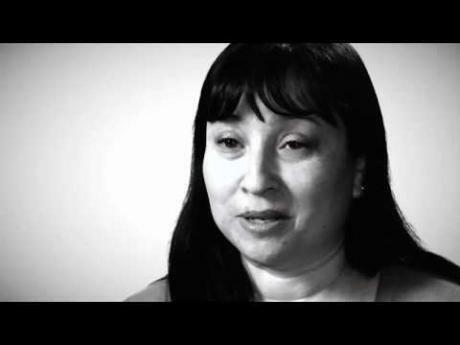 After intense legal negotiations and numerous solidarity actions, Linda Martinez went back to work nine months after being unjustly terminated by the Department of Social Services (DSS). 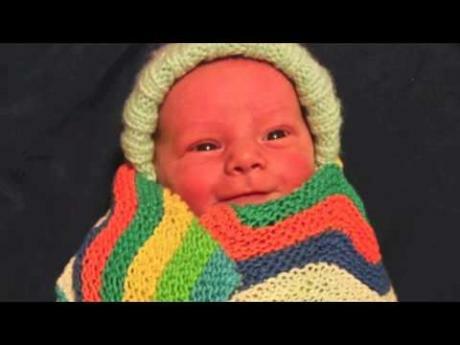 “The amount of persistence and expertise used to handle my case was impressive. I cannot thank Local 1000 enough for the work they performed on my behalf,” said Martinez. As the State Controller’s Office (SCO) works to overhaul the state’s antiquated payroll system, Local 1000’s team has been involved at every step to monitor their progress and mitigate its impact on state workers. The new system is called MyCalPays and will not only affect Unit 1 employees who process payroll, but all state employees, who will eventually have to transition to the new system. The new Outsourcing Task Force –created by the June side letter–is beginning to focus on wasteful private vendor contracts that can be eliminated, so that the cost savings can save taxpayer money and help preserve member pay and state jobs. Working with members on the Outsourcing Task Force Local 1000’s Contract, Research and Legal departments are reviewing and challenging those contracts that needlessly cost the state money. Once a contract employee with the state, Mike Bonner now partners with Local 1000 to help put a stop to the outsourcing of bargaining unit work. Not only does Mike lend his unique expertise to help identify contracts that cost the state unnecessarily, he trains other Local 1000 members to help do the same. During his time as a contract employee, he saw a great amount of waste and instances of bargaining unit work being done by contractors and he knew it had to change. Are student assistants or non-mission critical annuitants still performing the work of Local 1000 members in your office? Even though it’s a hot day in August and the election is not until November, Antonio Negrete joined with dozens of Local 1000 members and staff to knock on doors and contact voters at home. Unit 1 member leaders outfitting our children for success! 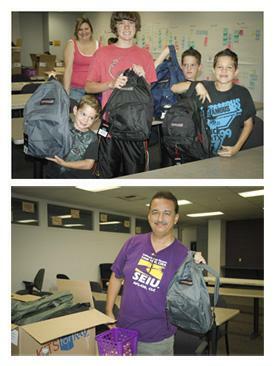 As schools open their doors for the new academic year, Local 1000 opened its doors to provide children the tools they need to succeed in class–backpacks filled with school supplies. 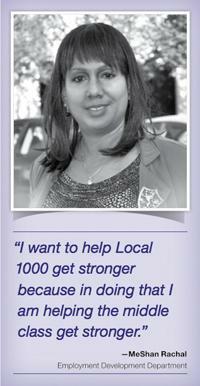 “Giving back to our members and communities is a big part of our vision at Local 1000. By starting these kids out right, we are investing in their future–in our future,” said Unit 1 member leader Cruz Naranjo (pictured right) at the Aug. 25 event in Sacramento. Similar events took place up and down the state. Bullying has always been a problem in the workplace, and Local 1000 has been taking steps to help members understand what it is and how to address it. Marie Harder, Vice Chair of Unit 1, has been busy giving presentations in 12 different departments on “abuse in the workplace.” She covers definitions of discrimination under the Civil Rights Act, what constitutes workplace violence, what is bullying, and protections in our contract and in the law. Because of the lobbying strength of our members, the Board of Equalization (BOE) announced Tuesday it has shelved a proposal to outsource some accounts receivable collections to a private firm. The original proposal called for a portion of uncollected accounts receivable to be outsourced to an undisclosed private vendor. Ever since this came to light, Local 1000 members and staff have pressured BOE to drop the proposal because this type of outsourcing doesn’t save money and private collection agencies are less accountable. Your elected representatives meet three to four times a year to plan and review issues affecting you. Here’s the full unit report from the Statewide Bargaining Advisory Committee meeting that was held on August 4th and 5th in Sacramento. The next meeting will be in San Diego on October 6th and 7th. The tough new language on outsourcing in our ratified side letter agreement provides our members with a strong new tool for preventing private contractors from doing the work of state employees. For months, Local 1000 has told State Fund that they were cutting “too deep,” with too many layoffs, and they finally listened. State Fund cancelled 267 layoffs that were scheduled for the end of May 2012, which included many Unit 1 and Unit 4 positions. Modkins says she’s especially appreciative of the hundreds of Local 1000 members who signed petitions or contacted State Fund Board members, telling them that the layoffs are happening too fast and too deep. Surplus letters are now available for State Fund employees who are scheduled to relocate in 2012. Employees impacted by the relocation can request a surplus letter from SCIF Human Resources. Surplus letters give you priority hiring status. Unlike SROA status, you are not notified of vacancies by hiring agencies and must seek out job opportunities on your own. Time period to cash out 80 hours of accrued time if you’re relocating more than 35 miles (Article 13). The Unit 1 DMV reclassification team along with the Unit 4 liaisonreclass team members, union staff, state negotiators and DMV management met in early March to discuss our new proposed job specifications for the Unit 1 Driver Safety Hearing Officers classification and to hear an update on the new Motor Vehicle Field Representative (MVFR) and Motor Vehicle Technician (MVT) specifications which had been previously presented by the reclass team to the state. Join us for our quarterly meeting of IT Professionals. Agenda includes: Announcement of 2012 Local 1000 IT Professionals Conference, Outsourcing Campaign Update, Report on IT Strategic Plan and Reorganization Proposal for the CA Technology Agency, and Local 1000 IT Strategic Plan update. Join us for our monthly meeting of IT Professionals. 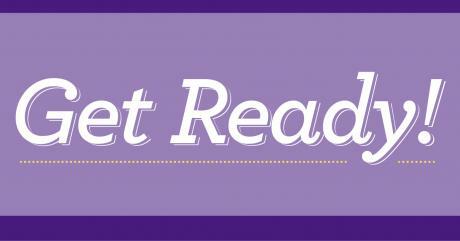 Agenda includes: Outsourcing news, legislative victories, and IT trends report. Dinner will be provided. What is the SROA program? Local 1000 has filed a grievance to stop the Employment Development Department’s (EDD) mandate that employees work outside their prescribed shifts without pay. Although “set-up and shutdown time” is paid work time under our contract, EDD has directed employees to work before and after their assigned start and end times. Intense lobbying by Local 1000 members forced the state to extend its layoff date for employees working within the 11 building complexes considered for sale under a budget scheme by former Gov. Arnold Schwarzenegger. The state extended its effective layoff date by sixty days from March 30 to May 1, 2011, to allow Gov. Jerry Brown more time to review the proposal. The extension allows us additional time to assist members in finding other job opportunities if the sale goes through. 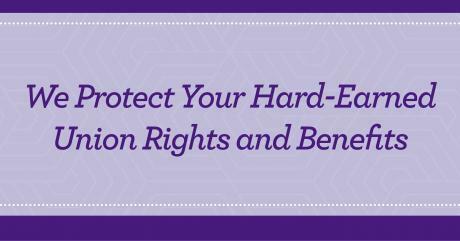 Preventing the sale will protect hundreds of members from layoff. Twenty-four Unit 1 members participated in a “contract review marathon” on Jan. 7 and 8 in Sacramento. The goal of the review is to identify superfluous outsourcing contracts to defend against State Personnel Board (SPB) challenges, Joint Labor Management Committees (JLMCs), and provide information to legislative committees. Fifty-two contracts were analyzed and 87 were targeted for additional analysis. Local 1000 will continue bargaining with the state to mitigate the effects of layoffs. However, the state hiring freeze makes it difficult for affected employees to transfer to vacant positions in other departments. Local 1000 represents nine different bargaining units and over 95,000 state employees. The power of these numbers enables us to make workplace improvements that make life better for everyone. This is a summary of the tentative agreement for Unit 1. 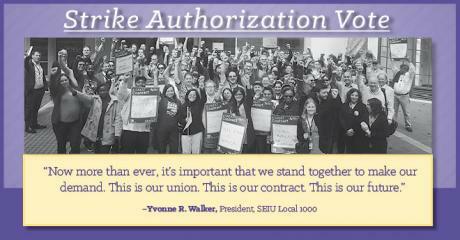 To learn more about all tentative agreements, visit the Contract Ratification page. An initial meet and confer was held with CDCR in late May on the effects of recent changes in the penal code on the workload of correctional case records analysts (CCRAs). Although no concrete agreements were reached, the meeting was helpful in developing a framework for future discussions. Representing Local 1000 were CCRAs Karen Devoll of Jamestown and Rhonda Roduner of Chowchilla. Future meetings are being planned to focus on workload issues concerning non-revocable parole (NRP) criteria and SOMS (a data management system for inmate central files). An overwhelming majority of employees did a “Vote of No Confidence” petition and marched in on a new head manager last month. Employees demanded a Joint Labor Management Committee (JLMC) to focus on workload issues and management harassment. The JLMC was agreed to on the spot. A major organizational priority this summer is political activism. Unit 1 members are committed to electing local and statewide candidates who support public services – and then hold them accountable. The November election is coming up and we need even more volunteers to ensure the right candidates win. If you can help, contact unit1@seiu1000.org. A way to build support for public services is to make sure our voice is being heard in the local media. Here are some excerpts from letters written by Unit 1 members. Keep writing those letters! Kevin Hopkins spent 26 years as a union member but was rarely active until 2008 – when he was pushed to the brink after seeing private contractors receive preferential treatment. After pressure by Local 1000, the Employment Development Department (EDD) converted 24 permanent intermittent positions to full-time positions last month, bringing the total number of conversions to 630 over the past five years. Local 1000 has successfully argued that EDD was understaffed even before the economic recession began in 2008 and the unemployment rate spiked above 12 percent, which forced the department to hire more than 1,000 people. Local 1000 has met twice with the state, and more meetings are planned, over the effects of the creation of this new department on our membership. Senate Bill 63 (2009) merged the functions of the now-defunct Integrated Waste Management Board and the Division of Recycling of the Department of Conservation into the new Department of Resources Recycling and Recovery, effective January 1, 2010. The legislation stated that no non-exempt civil service employee was to lose rights or employee status in the merger. The first ever Local 1000 IT Professionals Conference was held the weekend of April 17 in downtown Sacramento. IT professionals were able to network, get hands-on training and learn about trends in a fast-changing industry. “We hope this conference will set the stage for future events that will focus on the professional needs of the state’s IT workforce and other occupational groups within Unit 1,” commented Margarita Maldonado, chair of Bargaining Unit 1 and an associate information systems analyst at the Department of Justice. The California Department of Public Health (CDPH) is proposing to transfer assigned staff vehicles to an office car pool and reduce telework options for employees who investigate allegations of patient abuse. The union’s concern is that these administrative changes will make it more difficult for employees to efficiently handle high caseloads and actually reduce services to the public. For more information, contact Paul Romero, health facility evaluator II, at paul.romero@cdph.ca.gov. The dust has finally settled on CDCR (California Department of Corrections and Rehabilitation) cuts in its educational and juvenile justice programs. A key issue now is making sure that employees who transferred to other positions in lieu of layoff receive the training they need to pass probation in their new classifications. In addition, employees who transferred to CCRA (Correctional Case Records Analyst) positions have the additional hurdle of passing a background check. Local 1000 is sponsoring new legislation which would allow out-of-work Californians much needed, in-person assistance with their unemployment claims. AB 1827 addresses gaps in current law, and would require the Employment Development Department (EDD) to assign one UI representative to each of at least 50 one-stop and career centers. Claudia Gambaro often looks for ways to help fellowstate workers but she never predicted she would become Local 1000’s expert in helping them avoid foreclosure. 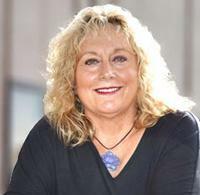 But when the housing crisis hit Gambaro and tens of thousands of state employees, she wanted to help herself and others keep their homes. AB 1897, introduced by Dave Jones (D-Sacramento) and sponsored by Local 1000, would repeal the authority of the Director of Finance to sell assets of the State Compensation Insurance Fund (SCIF). Earlier this year, Governor Schwarzenegger suggested selling $1 billion worth of the “book of business” to private investors. This bill would require the Governor’s nine appointees to the State Compensation Insurance Fund board of directors be subject to confirmation by the Senate. An SEIU-sponsored bill would improve the delivery of services to the unemployed. AB 1827, which has been introduced by Assembly Members Juan Arambula (Ind-Fresno) and Jose Solario (D-Anaheim), would amend the Unemployment Insurance Code to require California to have available walk-in unemployment insurance (UI) services, provided by current UI-funded and fully-trained workers in regional one-stop centers. For more information visit Politics & Legislation >> Local 1000-backed legislation. Local 1000 is sponsoring two bills that will enhance monitoring the state’s 13,600 personal services and consultant contracts. By our estimates, the state could save approximately $350 million annually by utilizing state workers to cut unnecessary and wasteful outsourcing in IT, medical services and architectural and engineering contracts. Join other Unit 1 members in pledging to help elect local and statewide candidates who support quality public services. We’ll be walking precincts and phoning voters in key districts up and down the state. Please make a commitment to help by completing the form below. As part of an invitation extended by the State Personnel Board (SPB), Brenda Modkins, Alternate Vice-Chair of Bargaining Unit 1, attended the focus group on behalf of Local 1000. Only one other state union attended the meeting. Local 1000 met with the Department of Personnel Administration (DPA) and the Department of Justice regarding the inclusion of the Legal Secretary and Legal Analyst classes into the three-rank pilot project. Local 1000 representatives had many questions. It appears some departments were simply included in the project to meet a required minimum of fifty percent. The meeting was concluded with a lot of unanswered questions by DPA and with Local 1000 anticipating full responses. The State Personnel Board (SPB) Executive Officer has ruled against the Department of Developmental Services (DDS) in a case challenging the outsourcing of a new community program assessment service. The executive officer agreed with Local 1000 that state employees are qualified, experienced and capable of doing this specialized work. The department has 30 days to challenge the executive officer’s decision and appeal to the full five-member SPB board. The cost of this contract is $1.6 million. The Union was notified in December 2009 that 15 of its members were no longer eligible to participate in a 403(B) retirement plan due to eligibility changes by the IRS (Internal Revenue Service). Local 1000 met with PERS management regarding revisions to the current gift policy. The new policy would prohibit gifts of any value to PERS staff that are in “designated positions” under the Political Reform Act. The Fair Political Practices Commission currently allows gifts of $10 or less to not be reported. The new policy has been implemented for non-represented staff, but is on-hold for Local 1000 bargaining units. About 2% of Unit 1’s 45,000 members have pending grievances. The four departments with the largest number of grievances are: Employment Development Department (EDD) — 327 cases; California Department of Corrections and Rehabilitation (CDCR) — 95 cases; Caltrans — 93 cases; and State Compensation Insurance Fund (SCIF) — 66 cases. Governor Schwarzenegger recently signed into law changes that could result in the early release of about 6,500 low-risk felons over the next year. Prior to release, correctional case records analysts working in the California Department of Corrections and Rehabilitation (CDCR) must review the records of more than 20,000 inmates to determine if they meet the new early release eligibility criteria to recalculate release dates.